Contact Us before placing your Order and we will set you up with a special Promo Code to be redeemed on this item! CTi and BuyWake.com have teamed up to provide you the best in knee protection on the planet. CTi brings over 20 years of experience and they are the #1 choice of pro Action Sports athletes worldwide. BuyWake.com Pro riders Keith Lyman and Josh Palma trust CTi, and so should you. The CTi OTS ligament knee brace by Ossur is the "Off-the-Shelf" version of the CTi Custom knee brace. 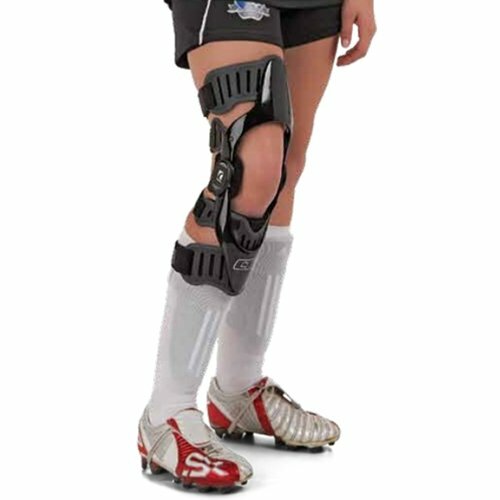 With many of the same features and benefits of the CTi Custom, the CTi OTS is a great option for athletes who cannot obtain a custom brace. CTi OTS braces are medical-grade products that are covered by most insurance plans with a doctor's prescription. We offer the CTi OTS for those who don't have insurance or can't get a doctor's prescription. Whether Custom or "Off-the-Shelf," every CTi ligament brace benefits from the input of medical professionals and feedback from professional athletes. The resulting braces are the perfect blend of support and function, designed to help you rehab and ride safely after a knee injury. Wakeboarders, skaters, and snowboarders have unique demands and anatomy. CTi OTS braces feature specific design advantages and/or adjustments that can be made to optimize performance. This item ships directly from the manufacturer. Please allow 4-6 business days for delivery. For proper sizing measure the circumference just below the distal border of the knee cap. Small Circumference: 11.000"-12.625" Medium Circumference: 12.625"-14.250" Large Circumference: 14.250"-15.375" XLarge Circumference: 15.375"-16.625" XXLarge Circumference: 16.625"-18.125"